To commemorate Ray Allen’s 2018 Hall of Fame induction, Jordan Brand has displayed a set of four PE’s replicating those worn by Allen in different stages of his career. Allen wore the Air Jordan XVI PE back in 2001, when he won the Three-Point Shootout and played in his second NBA All-Star Game. Made in white with green and purple accents, the highlights are the “RAY 34” personalization on the shroud and the chameleon-like purple and green on the toe-cap. As a member of the Seattle Supersonics, Allen wore the Air Jordan 20, designed to commemorate 20 years of Air Jordan. While Mark Smith’s lasering on the strap referred to moments in Michael Jordan’s career, the green and gold on the upper and pods was all Seattle. In Boston, Allen laced up some of his most coveted models, including the IX and the XI (he even once wore one of each during pre-game warmups). Some, like the XIII that released at retail, were just white and green, but the most memorable of them incorporated gold, foreshadowing the 2008 championship. 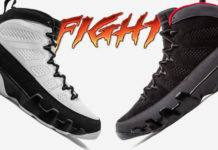 The final, flagship Air Jordan that Allen wore during his NBA career was the XX8, released in 2014 while he was a member of the Miami Heat. The white, perforated shroud was offset by accents of carbon fiber, metallic gold and university red. 21 years after becoming a Jordan athlete — nearly half a lifetime ago — Allen is being inducted into the Basketball Hall of Fame. To commemorate the occasion, Jordan has produced a set of four PEs replicating those worn by Allen in different stages of his career, from his beginnings in Milwaukee to his championship years in Boston and Miami. Each model will have special Hall of Fame branding on the sockliner, in addition to the years he spent with the team on a tag inside of the tongue. Four pairs of these celebratory Hall of Fame models have been made for Allen in his size.